This cooperation has provided young people from all abilities with taster sessions for horse riding plus the opportunity to acquaint themselves, with horses, in their spare time. They are able see the horses, to stroke them and/or brush them gently. With the confidence that this can give they can progress to sitting on a horse and taking a ride in the indoor school or outdoor school. When further confidence develops they can practise commands and learn how to handle the reins. To boost confidents further siblings our allowed to join in too. 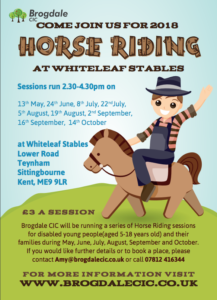 All of the above is dependent on experienced Brogdale CIC staff and the willing expert Whiteleaf Stables staff. Many young people have gone on to ride independently at the stables. But no matter how much they are able to achieve, they are enriched by the sessions and enjoy themselves greatly. The sessions are run on selected Sundays throughout the summer months on 13th May, 24th June 8th July, 22ed July, 5th August, 19th August, 2ed September, 16th September and the 14th October. Sessions run from 2:30pm till 4:30pm for all disabled young people and their siblings aged 5-18. Price is £3 per session. If you would like more information or to book a place please contact Amy by e-mail or phone at amy@brogdalecic.co.uk or 07812 416344 and we hope to see you there!! We would just like to say a big thank you to you and your team! We were really unsure if C* would even wear a riding hat, let alone get on to a pony – how wrong we were! Thanks to the staff at the stable and your team especially, C* went off with complete confidence and thoroughly enjoyed the experience. The only time he got a little upset was when he had to give the riding hat back!! We will definitely be booking him in for another session.